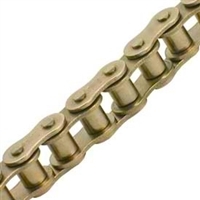 This #35 roller chain is manufactured in accordance with American National Standards Institute (ANSI) B29.1 standards and has been manufactured to the same dimensions since the beginning of ANSI/ ASA in 1930. Though dimensionally the exact same we offer three different quality levels of the #35 roller chain that goes above and beyond that standard strength and performance wise. Something important to note about #35 roller chain is that it is a rollerless-bushed type roller chain. Beaning that it actually has no physical rollers but just bushings. Economy Plus series #35 roller chain uses heat-treated precision components and features a solid roller design for improved performance. General Duty Plus series roller chain is essentially the same except uses a higher-heat treat thus making it better for high-speed and higher load applications. Premier Series roller chain uses the highest-strength components that have been heat-treated, shot-peened, and hardened to a maximum. They also implement a solid bushing (SBR) design and use a premium-grade lubricant for the maximum durability, strength, and working life. We stock a wide range of configurations for #35 roller chain including anti-corrosive, attachment chains, and specialty series. Note: additional information on product pages.